That was the message Lawrence Novak, lead structural engineer on the Burj Khalifa, had for a captive audience of students and faculty March 12. Novak discussed his approach to engineering the tallest building in the world and his belief in the human desire to build. Above, the world’s tallest building, the Burj Khalifa, towers over its surroundings in Dubai. Photo courtesy of Creative Commons Flickr. 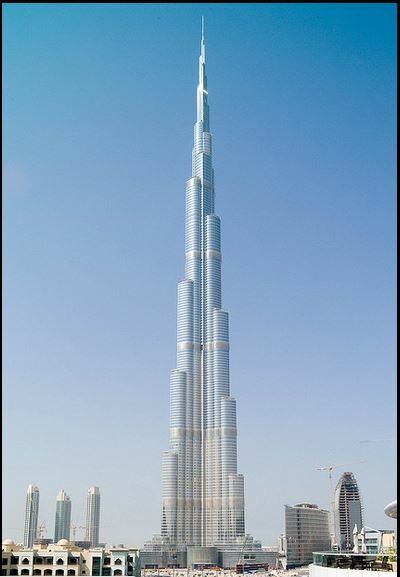 While its design may be simple, the Burj Khalifa was no small feat. The 2717 foot reinforced concrete structure towers over the surrounding area in Dubai and rises from a y-shaped footprint to punch through the clouds. Its wide base tapers up to a spire through a series of 24 setbacks while maintaining a distinct Islamic architectural style throughout. The Burj Khalifa, which surpasses the previous tallest building by over 300 meters, was entirely designed and engineered in the U.S. by Skidmore, Owings and Merrill but is owned by Emaar Properties, a Dubai-based company. That desire, paired with the right economic conditions, fueled the development and construction of the Burj Khalifa in Dubai. The city has been experiencing a building boom backed by a strong economy and a population willing to pay the high price of living in an elite property. “They don’t build anything there unless it’s predicated by ‘the world’s largest’,” Novak said. The world’s largest building took one of the world’s largest efforts. Before any designs were finalized, they underwent extensive wind and seismic testing to ensure that the Burj Khalifa could handle the intense forces it would be subject to. To demonstrate these engineering principles, Novak displayed videos of LEGO buildings on shake tables that mimicked earthquakes and in a makeshift wind tunnel in his backyard. The LEGO structures responded to these forces just as the Burj Khalifa would on a larger scale. That movement drove a design that equally emphasized stability and strength. Novak also extended his discussion past the technical topics and into the human elements of assembling the Burj Khalifa. He shared images with the audience of workers leaning over the edge of the Burj Khalifa to install bolts and described the difficulties of the man whose job it is to the clean the world’s highest windows. Students had positive feedback of the presentation. “I thought it was really good and really informative,” Vincent Terrone, a sophomore, said. Seniors Vincenzo Gerbino and Anthony Gallo agreed. “He was very insightful on something we don’t know much about,” Gerbino said. “I thought it was one of the best speakers we’ve had,” Gallo said.